Many retail positions have shifted from sales to order fulfillment. Brenda Vega is usually one of the first people at the Walmart in Lake Nona, Florida. She starts shopping at 4 a.m.
Vega makes her way through the aisles at a fast pace, placing dozens of items into bins on her cart. She relies on a hand-held scanner to find each item — milk, produce or electronics from across the store — and to find the most efficient path through the 190,000-square-foot building. Brenda Vega's job at Walmart as a personal shopper didn't exist two years ago. "You want to pick the best of the best," Vega said, as she selects oranges and scans them with her device. "I'm shopping as if I'm shopping for myself." But Vega isn't shopping for herself; she's picking items for customers who have placed their Walmart grocery orders online. After Vega completes an order, another employee delivers it to the customer's car. The device she uses not only guides her, it also tracks her performance, measuring the speed of her work against a company goal of 100 picks — individual grocery items — an hour. "We go by a pick rate, and they check it every week, and the faster you're going, the better hours you get," Vega said. "So I want to do it as fast as I can." Two years ago, Vega's job as a personal shopper at Walmart didn't exist. As of October, the company had hired more than 18,000 people for the job, who earn an average of $12.19 an hour. Walmart expects to hire thousands more in the next year as it doubles the number of stores offering the service. As Americans do more of their shopping online, e-commerce is fundamentally reshaping retail work, creating jobs fulfilling customer orders in stores and warehouses, while reducing positions at cash registers and on sales floors. But rapidly developing technologies might make many new e-commerce jobs obsolete within the next few decades. Inside e-commerce warehouses, workers labor in assembly-line-like fashion. There is none of the face-to-face interaction with customers that defines traditional retail work. Despite the closure of thousands of stores and predictions of a "retail apocalypse," the industry continues to employ nearly 16 million people, most in low-wage positions in brick-and-mortar stores. But in the past two years, traditional retail has begun slowly shedding jobs. The number of positions lost has been small — less than 1 percent of the retail workforce. And so far, for each of those jobs lost, nearly two have been created in warehousing, delivery and other e-commerce roles, according to a recent analysis by economist Michael Mandel of the Progressive Policy Institute, a left-leaning research organization. "I really didn't expect to find that," Mandel said. "If I told you how many jobs were being generated in e-commerce, you'd have laughed. You'd have said, 'That's absurd.'" Americans are spending far less time shopping than they did a decade ago — 64 million fewer hours a week. All that work consumers used to do themselves for free has become paid work for thousands of people in e-commerce, Mandel said. "You think about shopping, you get in your car, you drive to the mall, you park your car, you walk through the mall to the store," Mandel said. "What e-commerce does is it takes all those hours that you used to spend walking and driving, and it hires people to do those tasks for you ... and they do it fast and cheap." Not only is e-commerce generating jobs, but Mandel also found that pay in fulfillment centers is 30 percent higher on average than traditional retail work. Those new jobs often provide more regular hours and better benefits, too, he said. In some ways, work in e-commerce fulfillment centers resembles the factory work of a century ago. The centers themselves often resemble manufacturing plants, with hundreds of thousands of square feet and thousands of workers dedicated to processing customer orders. Some are located on sites that once housed factories for companies, such as Frigidaire and General Motors. Inside these warehouses, workers labor around the clock in assembly-line-like fashion, quickly lifting and moving items as heavy as 50 pounds. There is none of the face-to-face interaction with customers that defines traditional retail work. "I think warehouse work is very difficult; the speed of the work is faster," said Marc Perrone, president of United Food and Commercial Workers, a union that represents grocery, retail and warehouse workers. "Normal retail jobs, you might do some loading and unloading, but it's sporadic — it's not every moment." Twenty-five of Amazon’s more than 149 fulfillment centers worldwide use Amazon Robotics, said Amazon spokesperson Nina Lindsey. 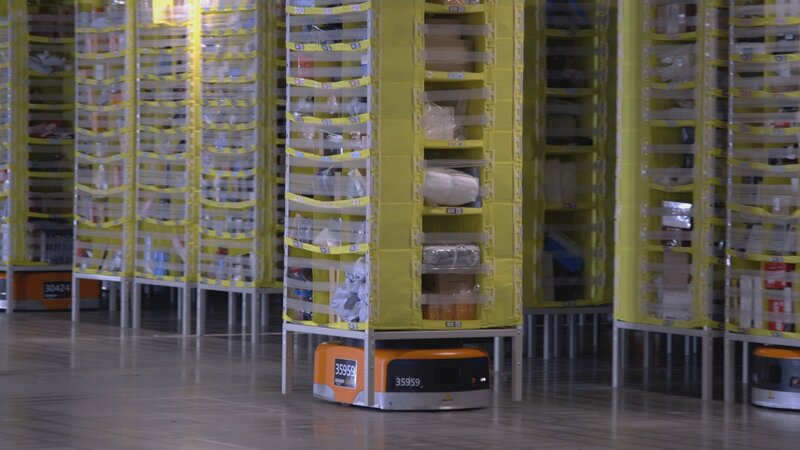 In one section of Amazon's massive fulfillment center in Kent, Washington, robots zip along a "highway," delivering items customers have ordered to "pickers" — employees who quickly select and place each item in a bin. A flashing light tells the worker when the bin is full, and the employee then pushes it onto a conveyor belt. "It's a really, beautiful symphony of robots and people working harmoniously together to fulfill our customers’ orders," Amazon spokesperson Nina Lindsey said. The bins traverse miles of belts as automated systems weigh, scan, sort and redirect goods, periodically encountering human workers along the line. Workers rapidly pack boxes by hand, move items onto trucks and perform other tasks that robots "simply can’t do right now," Lindsey said. "We're probably a good, I would say conservatively, 10 years away, maybe even more, from having a robot arm being able to reach into this bin and 100 percent of the time grab the right item," said Jerome Dubois, co-founder and co-CEO of 6 River Systems. Dubois founded his warehouse robotics firm after leaving Kiva Systems, which Amazon purchased and renamed Amazon Robotics in 2012. Dubois estimates only about 15 percent of warehouses currently use highly automated systems involving sophisticated robotics. The vast majority are still pushing carts around and finding items by paper records or hand-held scanners, he said. His company makes robotic carts that tell workers what items to pick and where to find them. Dubois predicts warehouses will retain their workers for at least the next 30 years. Perrone, the union president, said we must be prepared for those jobs to disappear even sooner. "In a couple of decades, there won't be any workers in the warehouse," he said. Lashonda Johnson, a 31-year-old mother of three, says the pay, benefits and steady hours she gets from Amazon are a vast improvement from what she grew to expect from her experience in traditional retail work. For decades, retail workers' pay has fallen relative to the rest of the workforce, and retail hours have become less stable. Software has made on-demand scheduling easier for companies and work hours more unpredictable for employees. "We're talking about some of the worst paid jobs in the economy, we're talking about jobs that don't offer a route up, talking about jobs that don't pay very well and have no benefits and where people's work hours are jerked around," Mandel said. "They are objectively horrible jobs." Lashonda Johnson, a 31-year-old mother of three, has worked in retail for 12 years and recently became a part-time associate at an Amazon warehouse in Miami. For Johnson, the pay, benefits, and steady hours she gets from Amazon are a vast improvement from what she grew to expect from her experience in traditional retail work. But she still has to work three jobs, six days a week to make ends meet. She says she earns $9 an hour at J.C. Penney, $10 an hour for a package delivery service and $11.25 as a part-time associate at Amazon’s fulfillment center in Miami Gardens, Florida. "If they offered me 40 hours a week at Amazon, I would be there," Johnson said. "I see the future as online only." The same employer practices that have made many retail jobs unstable could also find their way into e-commerce jobs, said Susan Lambert, a social scientist at the University of Chicago. There is already some evidence that warehouse workers are being divided into two groups: workers with regular hours, and temp and contract workers who work as needed. "The statistics for the warehouse workers will look very good, but there's also often a lot of contingent, temporary workers who are hired," Lambert said. "There is actually this fairly large group of workers who work in warehouses but have very unstable jobs." The warehouse workforce can jump by almost 25 percent during the holiday season, and temporary workers make less than their full-time peers, said Brian Devine, senior vice president at EmployBridge, which runs the nation's largest warehouse staffing firm. Devine has advocated for higher wages in the e-fulfillment industry. Perrone, the union president, said that although pay for e-commerce workers may be $2 to $3 an hour more than traditional retail jobs, it's not enough for workers to support themselves and their families. Retail is at the beginning of a sweeping transformation that will likely affect every aspect of the industry. The full impact on workers won't be known for years, Mandel said. "Broadly speaking, you can view automation coming into an industry in two phases. The first phase is actually about job creation and wage creation. The second phase, the job creation starts to go much more slowly," Mandel said. "We're barely in Phase 1 at this point." About 13 percent of retail sales take place online, according to research firm Forrester. By 2022, that figure is estimated to rise to 17 percent. Sales of some products categories, such as apparel and consumer electronics, are expected to move online at a much faster pace in the next five years. Over the longer term, it's unclear if e-commerce will continue to create more jobs than are lost in traditional retail. But in either case, many people currently working in retail are "going to be left out in the cold," predicted Nelson Lichtenstein, history professor at the University of California, Santa Barbara. Not everyone who works in retail will want to or be able to work in e-commerce. "Some of those retail stores will simply just go away, and the orders will be filled from a distribution center 50 miles away, not 5 miles away," said Devine, the staffing company executive. "It can be a physical job, so those people who that's not appealing to or can't do it physically, probably won't make the transition." Both Perrone, the union chief, and Mandel, the economist, said there needs to be a plan in place to help the millions of people who could be left behind over the next few decades. "We are the canary in the coal mine," Perrone said. "Automation is, in fact, coming, and when it comes, ... it will become faster and faster and faster, and we're going to have to be prepared for it." This Scripps News story was reported by Mark Fahey (@marktfahey), national investigative data producer, and Mia Zuckerkandel, producer. Luke Piotrowski shot and edited the video. Newsy anchor Chance Seales contributed reporting.